Should we be teaching kids what to think or teaching them how to think? But the more I think about this, the more concerned I am that this is a very dangerous trend. My question is – why is this presented as an either – or? Shouldn’t we be doing both? Should We Teach Kids How to Think? 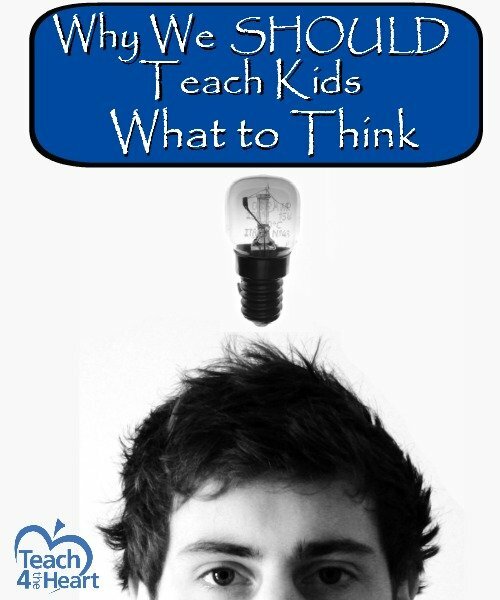 Is it important to teach kids how to think? Absolutely. Especially with the advent of the information age, kids need to learn how to process information and reach decisions. It’s not enough just to know facts. They need to know what to do with them. And perhaps in years past educators in general haven’t done a good enough job at this. Perhaps this recent movement is a reaction against a pattern that was too far in one direction. But I’m very concerned that in our attempt to fix one mistake we are charging headlong into another. Should We Teach Kids What to Think? I’m afraid that we are turning against facts, against truth. I’m afraid that we’re buying the lie that truth is what you make it. That there are no absolutes. 2 plus 2 is indeed 4. George Washington was indeed the first President. These are facts. They are the “what to think” that are not negotiable and must be taught. They absolutely need to learn how to think critically, but they need to be taught how to come to the right conclusion. The true conclusion. The concepts that “truth is what you make it” and that students must “find their own truth” are incredibly dangerous. And those of us who believe in God’s absolute truths must be careful not to follow along with these humanistic philosophies. Our students desperately need to learn how to look at a piece of literature, a news broadcast, or an online article and to discern truth from error. They need to be taught how to think about it. But we cannot just allow them to think that any conclusion they feel like coming to is the right one. Instead, we must teach them wisdom. Truth. And how to find it. There’s only one place we can turn that we know is 100% true – and that is God’s Word. The Bible is God’s absolute truth, and every word is sure. We can trust it. We can depend on it. And it must be the basis for how and what we think. As we teach our students to analyze a story, are we teaching them to think about it Biblically? Are we holding up the philosophies and actions of the characters against the one unchanging marker? Who cares what they think. What does God think? We do kids a great disservice when we imply that opinion is so important. Because it’s not. Our opinions matter very little. Our hearts are deceitful (Jer. 17:9) and we are not to trust in our own understanding (Prov. 3:5). And the only source of true wisdom is God. His opinion is the only one that matters. And the better we are at aligning our opinion with His, the more wisdom we will have and the more truth will light our lives. It means that we need to be intentional about teaching our kids both how to think and what to think. In short, we need to teach the next generation how to discern truth from error. Parents, we need to diligently teach God’s truths to our children. We should to be talking of them when we sit in our house, when we walk by the way, when we lie down, and when we rise up (Deut. 6:6-7). I don’t think this verse means that we should spout random verses at random times. It means that we must show our kids how the Bible applies to every aspect of life. What the Biblical response is to the news story we just heard. The decision the character in our kids’ favorite show should have made. And – most importantly – what it has to say about the difficult situations they are facing personally. Christian school teachers, your goal should be very focused and clear. Constantly refer students back to the Bible in class discussions and one-on-one conversations. Show them how God’s truths relate to science, history, art, and the TV show they watched last night. Walk them through the corresponding Scriptures and show them how they apply to the situation. Help them practice discerning good and evil (Heb. 5:13) so that they learn how to think Biblically on their own. Public school teachers, please don’t think that this just isn’t for you. Your job is just as important. No, you cannot be as obvious, but you have an awesome privilege and responsibility to be a light in the darkness. To give your students the truth. To counter the humanistic philosophies they’re getting in their other classes. So while you may not be able to clearly tell them that this truth comes from the Bible, you have every right to tell them that there is a right and a wrong. That Anna Karenina was not justified in following her heart into a love affair. That if an elderly man and a pregnant woman were on a lifeboat, you could try to find a way to save both of them instead of having to choose whose life is worth more. You can infuse truth into your lessons and interactions. We can teach truth. We must teach truth. These kids desperately need us to. Our country needs us to. Because everyone doing what is right in their own eyes is not working. Everyone making up their own truths is leading us to destruction. And we are the ones who can make a difference. Do you agree that we should be teaching kids both what to think and how to think? Why or why not? Share your thoughts with a comment below. Want more thoughts on how to teach our students wisdom? Check out my review of Rooftop Perspectives by Eric Reenders. Well said, Linda. People are so sensitive about being told they’re wrong that they agree not to say that anything or anyone else is wrong. It’s all about feelings now. Niceness has replaced correctness. Telling someone they’re wrong isn’t nice because it doesn’t make them feel good! Feelings have replaced logic. It is a self-defeating position because the promoters of this philosophy ARE willing to say that the statement affirming the existence of absolute truth is wrong! The statement, “There are no universal truths” is an attempt at a universal truth. Again, self-defeating. Ironically, the pushers of this agenda respond to critics in the exact same way that their critics are forbidden from responding to them. Anyone opposes it is the villain because they’re “judgmental.” Judging has become the worst crime possible, even though discerning between fact and fiction and between truth and falsehood requires one to make judgments! Somehow, the law of non-contradiction is neglected. The logical conclusion of this post-modern, nonsensical drivel is that your reality is whatever you want it to be. Hey, the Civil War started in 1861 to you, but to me, it didn’t, and we’re both right. The sun may exist to you, but to me, it doesn’t, and we’re both right. It’s actually quite lazy because it requires no investigation of evidence. You can have your own opinions, but you can’t have your own facts. Unfortunately, the line between them is becoming blurrier by the day. It’s true that you can have your own opinions, but not your own facts. But people mistake their opinions for facts, and that’s the humanism that you speak of. Obviously, this is a problem. This might mean they come to different conclusions (what to think) than us. It happens. And who, besides God, is to say that I’m right, and they’re wrong when it does. God definitely is the only source of absolute truth, but you’re wrong about thinking that we cannot know it for ourselves. Jesus said, “you shall know the truth, and the truth shall make you free.” (John 8:32) God wants us to know the truth – that’s why He gave us the Bible. Now, I completely agree with you that the Bible has been used to excuse some pretty messed up stuff. But the issue there is that someone twisted and distorted the Bible to make it say what they wanted it to say…which leads to serious problems. And that’s why we need to diligently study the Bible. We need to know exactly what it says and interpret it correctly. We need to think the way that God thinks. There are certainly areas that are confusing and not quite clear, so those aren’t issues we should be so emphatic about. But there are many things that the Bible is crystal clear on, and if God is crystal clear on it, then we absolutely can know that it is true and absolutely should teach our kids that it’s true. God wants us to know the truth. That’s why He gave us the holy spirit to “guide us into all truth” (John 16:13). Yes! Yes! Yes! Yes! YES!! Linda, thank you for sharing this! I did some math yesterday, on average we will spend approximately 900 hours with our elementary students over the course of a 180 day school year. 900 hours is a HUGE responsibility! And a huge opportunity to help them THINK well. Again, thank you for sharing this! Your passion was encouraging and contagious. ? As a public school educator and human being, I ask my kids to think with a questioning mind and accept observations about the world when they are logical and good for humanity and the world. WE can trust when our head and heart align.